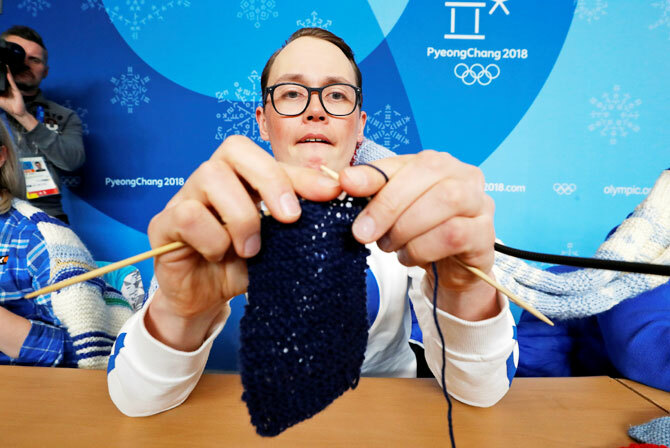 "It has become something of a hobby for me," smiled snowboard coach Antti Koskinen, who has been spotted with his needles out in the snow. "I mean I do it every four years... it is a nice, Finnish thing... it means no unnecessary chit-chat is needed." "We are knitting a blanket for our president's child," Koskinen said. "Everyone is knitting a little square, and then we will join them together... I got a bit carried away, so... a rectangle," he laughed, holding it up. "Maybe mine can be for the president's dog," he chuckled. President Sauli Niinisto's wife Jenni Haukio gave birth to the couple's first child on February 2. Niinisto, 69, and Haukio, 40, were married in 2009. The child is Haukio's first and Niinisto's third. Niinisto lost his first wife in a car accident in 1995. 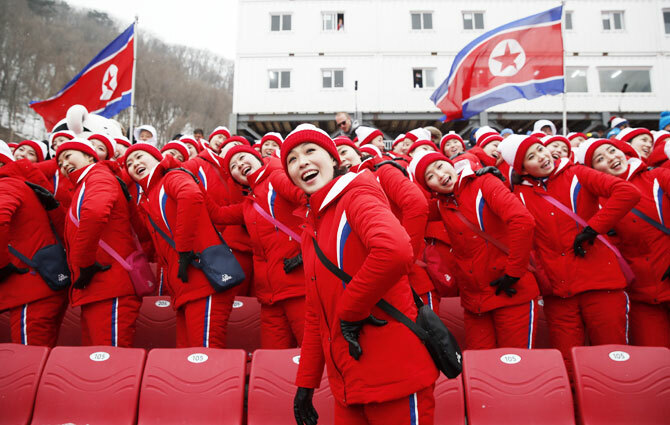 A friendly chanting exchange between North Korean cheerleaders and South Korean fans was the only show on offer at the women's slalom on Wednesday as high winds wreaked more havoc on the Alpine skiing schedule. Long after organisers announced the postponement of the race until Thursday, noisy contingents from both countries remained cheering and singing in the stands as other spectators shot photos and video of them. "WE ARE..." yelled the several dozen North Koreans, all dressed identically in red ski jackets and white and red hats. "ONE!" responded a slightly smaller group of South Koreans at the back of the tribune. Both groups were flying the unified Korea banner, showing an outline of an undivided Korean peninsula, under which the two countries' combined women's ice hockey team is competing. The northerners also sported a large national flag, and each of them waved their own miniature version. After months of high tensions over North Korea's nuclear weapons programme, the presence of its athletes and cheerleaders at the Games has been greeted by some in the south as a possible sign of detente, and their every move is attracting avid attention. "At this time we feel something is changing between the south and north," said Seoul's Baek Nakki, as he stood observing the crowd. How did he feel towards the visitors from the north? "They are well organised, well planned, well scheduled but they seem to be forced to do that."